From the department of missed opportunities comes an idea from Popeyes that sounds like a weirdly appealing food mashup from your Facebook feed: a fry crust made with a cheddar-biscuit batter. Save your melodramatic gasps and proclamations that the apocalypse is nigh—this sounds like a most excellent idea. If only Popeyes nailed the execution. The canon of crispy coating has seen experiments with exotic batter bases like cornflakes, potato chips, saltines, even ground-up Cheetos. The appeal of using cheddar-biscuit batter is clear: the butter-to-flour ratio is high, and the addition of cheddar means, well, fried cheese. 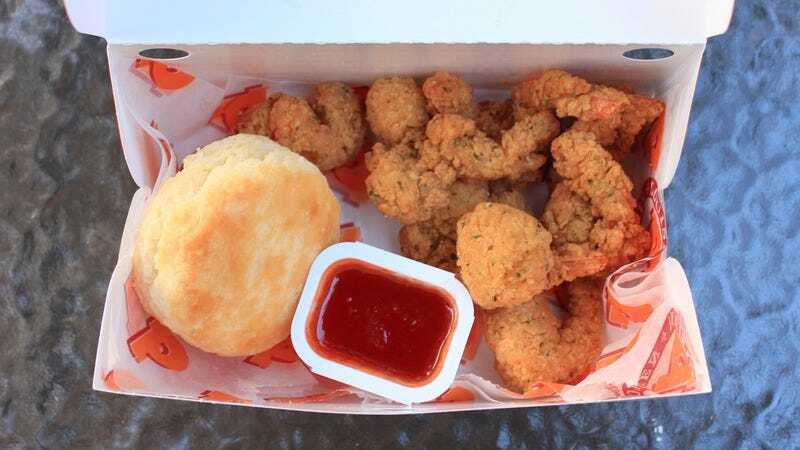 Popeyes has unveiled a limited-time offering that takes its butterflied shrimp, dredges it in a cheddar-biscuit batter, deep-fries it, and serves it with a ghost-pepper jelly sauce. This sounded like such a genius combination, I found myself at my neighborhood Popeyes within five minutes of seeing the TV commercial. Upon receiving my order in Popeyes’ cardboard tackle box, I was encouraged to find the shrimp wasn’t enveloped in flimsy coating; a sturdy shell held snugly onto the protein inside (it’s a damned shame when a fry coating slips off upon biting in). That batter had a graininess to its exterior (which suggests a dry rather than a smoother wet batter), pockmarked with what appeared to be parsley flakes. Crispy wouldn’t best describe its texture—more like crispy taking its first steps toward crunchiness. Where it disappoints (like my father always told me) is that it never fulfills its potential. Those four words together—cheddar biscuit butterfly shrimp!—is a hell of a premise, but there was not one hint of cheese and I bit and chewed as thoughtfully as a cow with cud. A taste of buttery dough? Yes. The biscuit part was subtly evident, but not much cheese. Instead, it bore that very specific taste of Popeyes’ cooking oil—instantly identifiable with its fried chicken—but ended up tasting like any other pedestrian fried shrimp, albeit a good version. The ghost-pepper jelly is another thing that sounds enticing paired with fried shrimp. Ghost peppers, some of the world’s hottest chiles, have been trending at fast-food chains the last several years as consumers sought next-level spiciness. Popeyes’ version, however, lists ghost-pepper powder behind red-bell-pepper purée and red-jalapeño purée, and there is not the slightest notion of piquancy in this sweet, smooth, wimpy condiment. But it’s perfectly tasty—especially slathered on one of Popeyes’ marvelous biscuits—but again, conjured lofty expectations that fell short. We can take solace in the fact that most recipes can’t be trademarked (you can try to patent but it must meet certain standards). Because some enterprising restaurant should develop a proper fry batter using cheddar biscuits. It’s an ingenious idea; we’ll tip our hats to Popeyes for supplying it. Now we just need one chain to nail the recipe and we’ll shower the restaurant with praise and business.